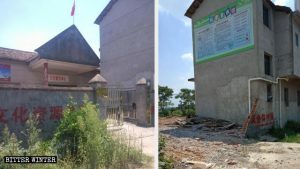 Combination Buddhist shrine and tourist attraction, the statues are unacceptable to Chinese authorities, so they must be disappeared. Arhat statues temporarily being hidden behind billboards as they await removal. 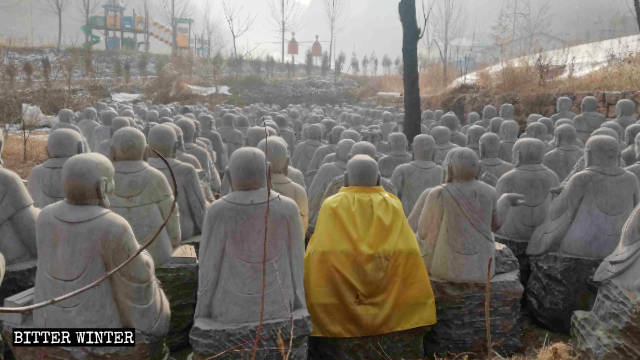 Approximately 260 Arhat statues at a famous tourist attraction in Wu’an city, in Hebei province near Beijing, have been removed. The fate of more than 200 other Arhat statues remains in the balance. Arhat statues are representations of Buddha’s disciples who have gained insight into the true nature of existence and have achieved nirvana. 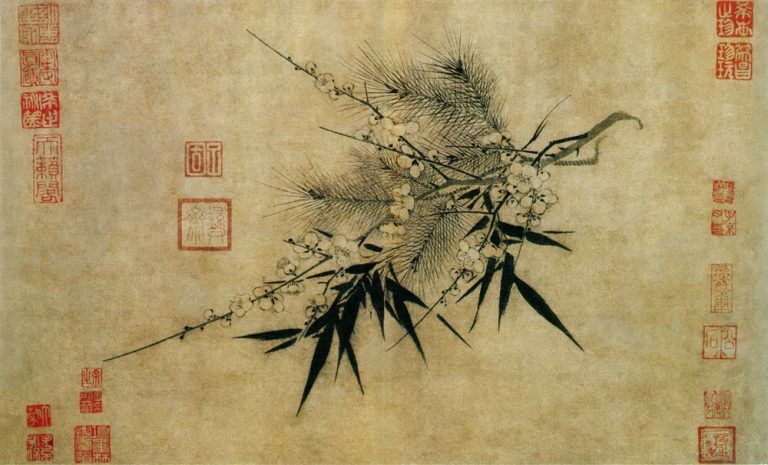 Bitter Winter reported in December 2018 that the local populace used various clever methods to cover and hide the religious works of art, after 500 Arhat statues at the famous Qibugou Scenic Area in Wu’an City, Hebei Province, were listed for removal by authorities. Citizens tried using billboards and cloths to cover them. Still, in the end, the statues were unable to escape their fate. The Arhat statues were originally placed along the route up the mountain in the Qibugou Scenic Area, arranged in four columns with the road passing between the columns. 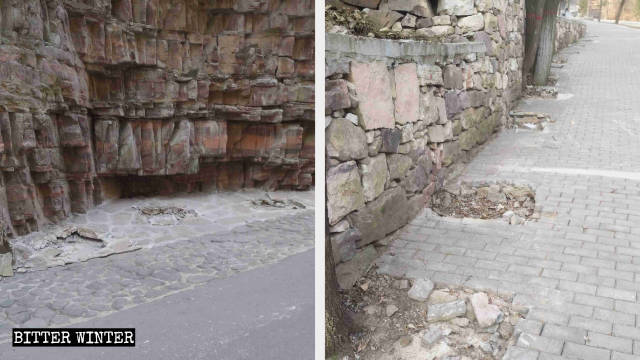 Over the past few days, the reporter of Bitter Winter returned to the Qibugou Scenic Area and discovered that there are now no signs of the Arhat statues by the route, except for the marks on the ground left from their removal. There are now no signs of the Arhat statues along the route, except for the marks on the ground left from their removal. 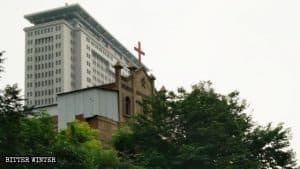 A worker from the scenic area recalled to the reporter that, when the Central Inspection Team came to the city on patrol, they demanded that religious statues be removed. 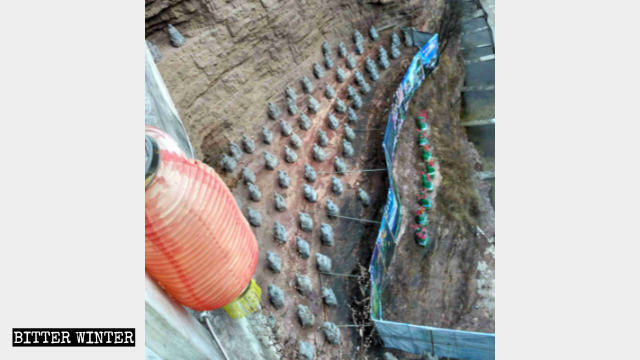 In mid-December, the head of the local Township Armed Forces Department personally appeared to direct a demolition crew in using an excavator and crane to remove the Arhat statues. 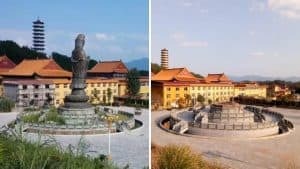 Currently, approximately 260 Arhat statues have been removed and transported to the remote vacant lot next to the skiing facilities of the scenic area. As the remaining Arhat statues are in areas of high elevation and are difficult to transport, they are temporarily being hidden behind billboards as they await removal. About 260 removed Arhat statues are now in the vacant lot next to the skiing facilities of the scenic area. 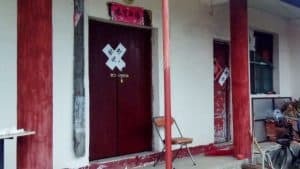 “Even though they are hidden behind billboards, it’s difficult to protect them now. There’s no telling when they’ll be removed,” the worker said helplessly. The Qibugou Scenic Area of Hebei is one of China’s 4A national tourist attractions and is one of Hebei Province’s primary tourist construction projects. (Tourist attractions are rated in China on a scale with 5A being the highest level.) In May of 2009, the scenic area was re-planned and re-constructed, with a total of 1.2 billion RMB (approximately $177,260,000) in investments. The 500 Arhat statues were among the famous sights in the scenic area, and they received a lot of attention from tourists. 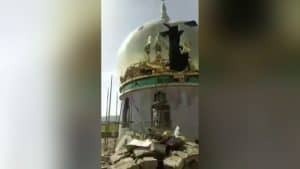 Now, amidst the CCP authorities’ drive to destroy outdoor religious statues, they have been wrecked in an instant.